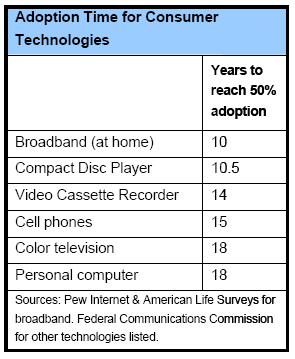 Half of all Americans now have broadband at home, according to the Pew Internet Project’s September 2007 survey, marking the first time that as many as 50% of respondents say they have high-speed internet connections at home.1 This milestone in broadband adoption occurs at a time of close scrutiny of the data gathered by government agencies on broadband deployment. This backgrounder puts the rate of home broadband adoption in historical context before discussing in detail the issues surrounding broadband data collection and current legislation that seeks to make improvements. Even though telephone surveys, such as those conducted by the Pew Internet Project, continue to accurately measure broadband adoption and use at the national level, many key questions about the information society require fine-grained data about broadband deployment and use at a local level. This kind of detailed and publicly available information can only be collected by government agencies. The quick pace at which high-speed internet has found its way into Americans’ homes stands in sharp contrast to how government statistical agencies have adapted to measuring broadband. The focal point for worrying about tracking broadband is America’s low ranking in international comparisons of home broadband penetration – 15th in 2007 according to statistics compiled by the Organization for Economic Cooperation and Development down from 4 in 2001.3 Policymakers wishing to criticize the rankings quickly learn of the inadequacies in the data underlying the U.S. ranking collected by our own Federal Communications Commission. As broadband’s importance in carrying out everyday activities grows, new issues arise for a variety of stakeholders. Rural communities may want to do something about lack of broadband infrastructure, but many don’t have the data to tell them precisely where deployment gaps exist. Economic development officials in cities wonder whether higher quality information infrastructure would improve their prospects for attracting jobs. The economists on whom they rely for answers struggle to provide reliable advice. That’s because there are no systematically collected and publicly available sources of data on adoption and deployment of broadband at the local level. Finally, a variety of organizations, large and small, for profit or not, want to know about the user experience to design service delivery programs more effectively. The research community has been aware of the data problems for some time, and in June 2006, researchers at the Pew Internet Project, the University of Texas at Austin, and the Massachusetts Institute of Technology convened a workshop to discuss ways to address them. The workshop included academics, state and federal officials from data-collection agencies, and staff from Capitol Hill. Soon thereafter, Congress began to consider how to improve data collection for broadband. The gathered experts kept coming back to the need for granularity in data collection. That is, whether the goal is assessing economic impacts or understanding user behavior, data must be collected at the smallest geographic levels possible – smaller than areas captured by 5 digit zip codes. This would permit state and local officials to better understand the impacts of information technology in their areas. Workshop participants also agreed that the United States should be able to produce a map showing the availability of broadband infrastructure. This map must be built from the bottom-up, so measures at the local level are necessary in some detail. Legislation currently working its way through the House and the Senate captures many of the key points raised at the workshop. In the Senate, Commerce Committee Chairman Daniel Inouye has introduced the Broadband Data Improvement Act, which, among other provisions, calls on the FCC to reevaluate the current definition of broadband to develop a new “second generation broadband” metric. Workshop participants also called for updating the definition of broadband; the 3 current definition of broadband is 200 Kilobits per second in one direction – far slower than speeds advertised by most services today. The Inouye bill also requires providers to report broadband availability in 9 digit zip code areas – a level of disaggregation that will enable robust mapping of infrastructure. At this point, it is unclear how the House and Senate would resolve their differences should each chamber approve a bill. Although there is widespread consensus on the desirability of better broadband data collection, details are controversial. Industry understandably worries that public disclosure information on infrastructure availability and network speeds could give away proprietary data. Depending on the level of specificity, data on user behavior raises worries about personal privacy. However, if improvements in broadband data collection are enacted into law, that is only the beginning of a process to map and measure information infrastructure in the United States better. Ongoing dialogue with research community is needed to properly implement any new law. The researchers assembled at the Pew Research Center will be key resources when the time comes to put into practice new broadband data collection provisions. Read the full workshop proceedings at pewinternet.org .